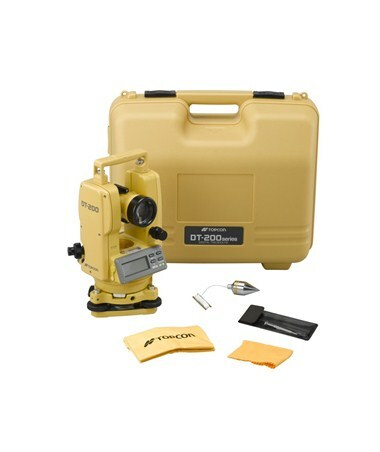 The Topcon DT-200 Series Advanced Digital Theodolite takes highly specific angle measurements. This survey tool has a 2.5-second resolving power and a 30x or 26x magnification option. For a more systematic measuring, it features a dual-axis compensation. The DT-200 offers a dual display or a single LCD display option. Also, it features a five-button interface panel that is easy-to-use. To help get accurate measurements, this theodolite includes an optical plummet. In addition, the DT-200 series offers a laser pointer option that has a range of 165 feet. The Topcon Digital Theodolite features a reticle illumination that is great to use in environments with low light conditions. 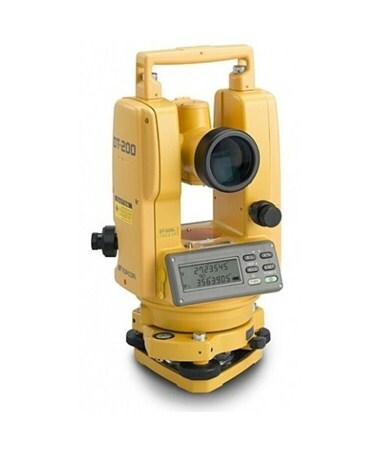 It can work up to 140 to 170 hours with theodolite only and 45 hours using both theodolite and laser. With an environmental rating of IP66, it is dust proof and water resistant. The Topcon DT-200 Series Advanced Digital Theodolite offers six models with varying features. Please choose from the drop-down menu above.